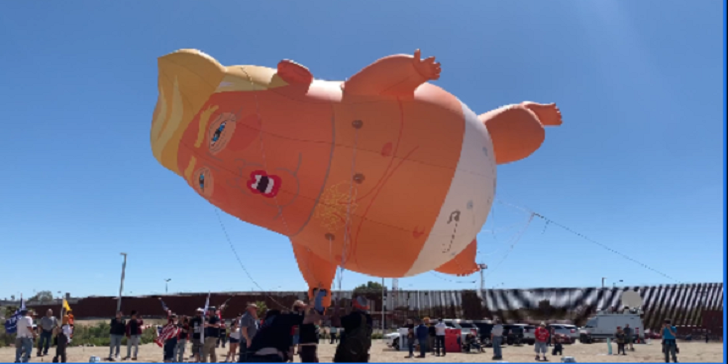 A giant air balloon that resembled a baby President Donald Trump clad in a diaper was released at the Mexican border on April 6, 2019, as a sign of protest against the US President. Following the President's regular rants about building a wall that would separate the United States from Mexico, protesters flew a giant air balloon of a baby President Donald Trump. The balloon depicts an infant version of Donald Trump holding a cellular that was released ahead of the President's arrival at the Mexican border on Friday. The balloon has been dispersed on several occasions, greeting the President at his arrival to different states across the country. President Trump is expected to meet with his local official of the federal immigration during his visit at the Mexican border. On Thursday he issued a one-year warning to the Mexicans before enacting the laws of a complete shutdown of the Mexican border.